Austrotaxus spicata, as described in 1922 by Robert Harold Compton (1886–1979) in Journal of the Linnean Society, Botany 45th edition, is commonly known as New Caledonia yew or Southern yew. The species name describes the spike-like pollen cones that help to distinguish this conifer. Description. New Caledonia yew is an evergreen coniferous species of shrub or small tree that grows to mature heights of 15 to 65 feet (5 - 20 m) (rarely to 80 feet / 25 m) tall with a trunk up to 12 inches (30 cm), measured at breast height. Bark is reddish in color, richer and darker in areas where bark has flaked away. In time bark weathers to grayish brown. 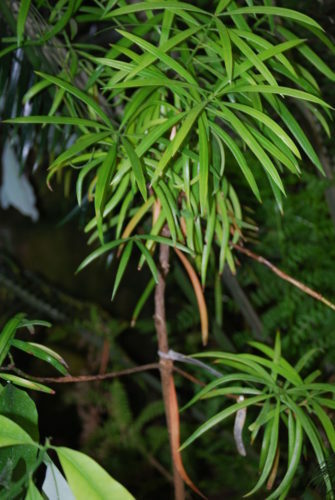 Leaves have a lanceolate outline, are are flat, measuring 3.2 to 5 inches (8 – 12 cm) long (up to 7 inches / 17 cm on young plants) and 0.16 inch (4 mm) broad. Individual needles are colored dark green adaxially, with two paler green stomatal bands below; they are arranged spirally on the stem. Pollen cones measure 0.4 to 0.6 inch (10 – 15 mm) long, with a slender shape. Seed cones are drupe-like, measuring 0.8 to 1 inch (20 – 25 mm) long, with a fleshy aril almost completely surrounding the single seed, but with the tip of the seed exposed. The markedly longer leaves and large seeds readily distinguish it from the yews in the genus Taxus. Distribution. 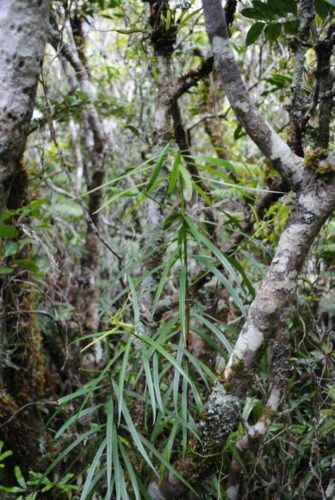 This species is endemic to only New Caledonia, where it grows in the central and northern parts of the island on serpentine soils at elevations of 1,000 to 4,000 feet (300-1,350 m) above sea level. Attribution from: David J. de Laubenfels; No. 4, Gymnospermes, in A. Aubréville and Jean-F. Leroy, editors; ©1972, Flore de la Nouvelle-Calédonie et Dépendances; Muséum National d'Histoire Naturelle, Paris, France. Austrotaxus spicata — a closeup of foliage detail of a specimen growing in nature. 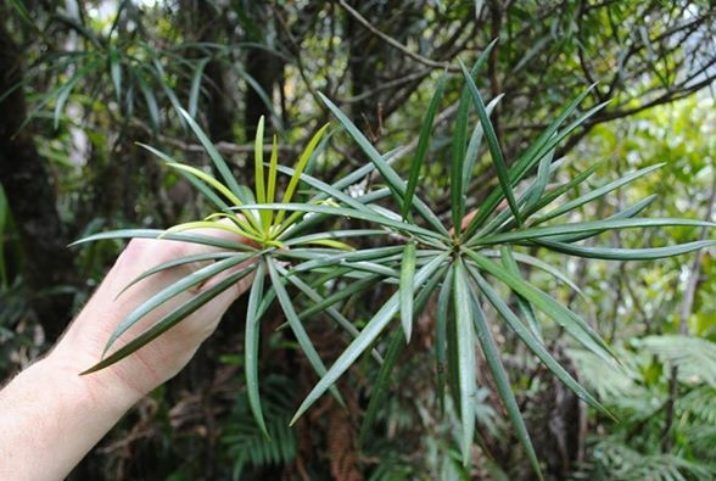 Austrotaxus spicata — a specimen growing in nature in the jungles of New Caledonia.